There is a quote that says, “A good friend knows all of your best stories but a best friend has lived them with you!” Who are those people in your life with whom you have created the best memories? Whether you’d come with your best friend or significant other, we would love to invite you to Nantucket, where you can make memorable memories to last a lifetime! What better way to connect and deepen the bonds of friendship by gathering at our inn located in Nantucket, MA. Our island vacation home near Jetties beach is quaint, inviting and comfortable. It’s a place where you can escape the busyness of life and completely relax without interruption or where you can find a new adventure to explore every day. We have four luxurious suites in our Main House and two more suites in our adjacent Guest House from which to choose your favorite room. A conventional hotel in town is simply no match to the amenities that our inn offers. We are also an adult only inn, geared to providing couples with the ultimate private, relaxing (and fun!) accommodations on the island. As we mentioned there is an abundance of things to do here on the island but one idea if you are thinking of spring or summer retreat is a clambake! 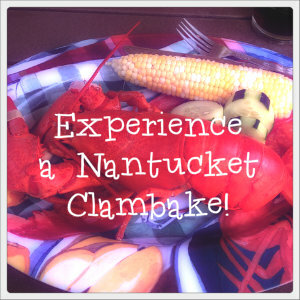 The Nantucket Clambake Co. can provide this classic island experience for you. They can meet you on the beach and will provide everything you need. All you have to do is come hungry. They also offer traditional New England Pit Bakes. Their classic menu includes Clams on-the-half-shell, Nantucket Clambake Chowder, homemade cornbread, lobsters with drawn butter, mussels in herb butter, corn on the cob, BBQ chicken and dessert and coffee to top it all off. Wow – what a mouth-watering experience! You simply have to try it! We would love to help you plan a memorable vacation to Nantucket. Simply book your room online and contact us anytime for further information. There is no time like the present to enjoy life to the fullest so come and visit us! This entry was posted in Dining, Things to Do by admin. Bookmark the permalink.